Rob Davies - Microservices through Continuous Improvement: Fuse At the DevNation Conference! Fuse At the DevNation Conference! The JBoss Fuse engineering team have sponsored and organised CamelOne for the last 3 years, but after CamelOne 2013, the opportunity came up to put all the effort into a new developer conference, sponsored by Red Hat called DevNation. This is the first time the event has been run, and its a great opportunity to learn about all aspects of development and deployment. CamelOne was focused on Apache projects used for integration, but that in itself is quiet limited, and as an integration developer, you have to be able know about so much more. DevNation is an opportunity to learn from like minded developers about all aspects of real world deployments, from Hadoop to elastic search, from best practices in DevOps or OSGi, to getting an insight into Docker, Apache Spark, Elastic Search and so much more. DevNation has a lot of promise to be a great developer conference, with a broad scope that will be informative and fun. Its for this reason that the fuse team decided to focus our attention on DevNation this year, rather than CamelOne. The traditional way of delivering applications is outdated. Many users are rolling out across hybridised environments, and the need to be insulated from all the different environments, to have location independence and the ability to dynamically deploy, find and manage all your integration services is going to be the key theme for the Fuse tracks at DevNation - as well as all the usual tips, tricks and secret ninja (OK undocumented) stuff that we like to share with the attendees. 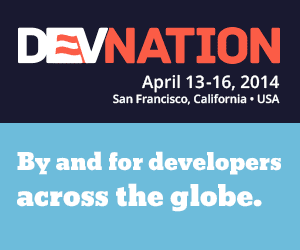 DevNation this year is being held in San Francisco, and will run from Sunday April 13 - 17. You can register here - and we really hope to see you there!